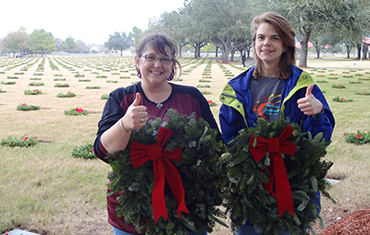 In December, Houston Aggie Volunteers and students from the Caring Aggies Mentoring Program will join Wreaths Across America to lay wreaths to honor those who served and sacrificed, including the 21 Aggies at rest in the National Cemetery. An estimated 15,000 people will pass through the gates of the Houston National Cemetery that day to pay their respects and place more than 60,000 wreaths. Our heroes will be honored with a ceremony complete with a 21 gun salute, echo Taps, a bagpipe troop, and a Coast Guard fly-over. For an entire month, the gardens of stone will be wrapped in holiday elegance. Then, in January, an estimated 1000 volunteers will remove all traces of the season as a new year dawns. The Houston A&M Club is once again partnering with Wreaths Across America – Houston to raise funds for laying wreaths at the Houston National Cemetery. Last year donations allowed for wreaths at over two thirds of the 60,000+ gravesites. We need your help to meet the goal of all the gravesites! Wreaths Across America is a non-profit organization dedicated to honoring and thanking our veterans for their service and sacrifice. $15 sponsors a live wreath,and supports C.A.M.P. If you know an Aggie interred at the cemetery, please tell us. Participate in the wreath laying ceremony honoring our veterans.